After 3D printing a mold design using an Ultimaker 2 [Matt Borgatti] casts the mold using Smooth-On Mold Star 15 that can withstand heat up to 450 °F (232 °C), which he points out is ideal for the low-temp metal casting alloy tin-bismuth comprised of 58% Bismuth and 42% Tin with a melting point of 281 °F. You may have heard of molds created from 3D printed parts before, but what makes this tutorial great is that the author, [Matt Borgatti], really sets you up to be successful. He offers up plenty of insights including mold-making techniques and terminology like why you would need a well and runners designed as part of your mold when casting with metal. You can either reproduce his designs or use the tutorial to create your own which makes it a good start for beginners as well as another method to file away for people who already have experience 3D printing molds. This post is also really a twofer. Not only do you get detailed instructions for the method but [Matt Borgatti] uses his casted metal part for a flat-pack camera arm he designed to document projects with which you can also build using his files found on Thingiverse. 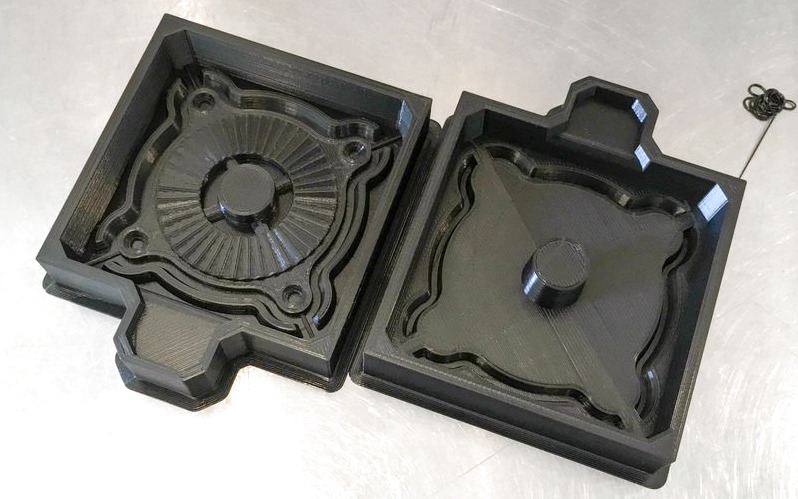 To create molds for precision parts and to learn more about using a 3D printer as a tool in the casting process, check out this method for creating higher resolution molds with a resin printer. Agreed – that’s far better than being limited to low-temp alloys. If that is what you need.. else it doesn’t matter. Indeed–it doesn’t always have to be the strongest, most legit, most difficult. Low temp alloy in a silicone mold has the advantage of being easily re-cast in the same mold over and over again, and the flexibility of the mold means you can get parts out which would normally require destroying the mold. It’s got a lot of advantages, but you could cast a different metal with an investment cast if pot metal really isn’t good enough. Or just cast in 2k PUR or Epoxy – should be even better than tin. Well, sure, if you only want one part. If your infill is really low, the prints won’t take too much time. On the other hand, if you cast wax instead of metal into the silicone mold, you could do lost wax casting and make your part out of any metal you want. I haven’t had any luck burning out PLA from a plaster mold to do lost “wax” casting. Anyone have tips? I have easily cast it many times perfectly in silver. What problem s are you having? Many factors and variables here. What type of “plaster” investment are you using? How are you mixing it,? What are you using to burn out the flask? Do you allow bench rest before placing in the kiln? What metal are you using? I take it there’s something wrong with just wrapping a part in clay? Once for the lower half, once for the upper half, fire in a kiln / hot oven? I don’t know specifically what’s wrong with that, but if it was that easy, green sand casting wouldn’t need to have been invented. I’m guessing the main problems are things like thermal shock breaking the clay, and removing the casting from the mold without breaking it. Using silicone molds makes removing the mold easy. Of course, you can certainly use 3D printed models in green sand casting. No, but that silicone mold is going to be good for a ton of casts. Judging from the design of that camera arm he’s going to need a pair for each articulation, so making a flexible and reusable mold seems smart. You can make reusable clay molds but they will wear harder than silicone. Silicone is just generally simpler to handle. Low shrink, pristine surface finish, flexibility. Look at some comparison for molding sands – their surface finish is really not that super, unless you get the good stuff. But sure, for large parts I guess clay is also great for DIY – large parts and parts where the more organic surface is part of the charm. The problem with using clay, especially if you need your part to be a certain size, is that clay shrinks as it dries, standard stoneware shrinks by about 20% between being formed and being fired, so if you just want a cool little trinket of no particular size, yeah clay molds would probably work fine, but if you need a part of a certain size to fit a certain space and perform a specific job, you would have to print it about 20% larger than you need, fire your mold, cat it, then probably do a bunch of machining to make it work, and even then you might have trouble. Always good to see nicely documented explanation of how to do it. That camera support he built was some serious overkill. He must really like wood. I have used smooth on in other applications and I was dissatisfied with the results. I would use the 3d printer to print in nylon then she’ll cast the nylon. It should burn out ok and then the item can be cast in aluminum, brass, steel or bronze. Using potmetal has limitation. Very nice process, but the low temp alloy is likely not much more stable than a high performance plastic directly from the printer. We’ll get her a bio up on the About page in short order. Welcome to the HackaDay team, Lara! Make a high detail printed silicone mold. Use it to make wax items, as many as you need. Use the wax items for lost wax casting. Cast gold, silver, unobtainium if you can get it. Combine one of the oldest casting techniques with one of the newest. Now: can my ordinary printer print silicone? No, it can’t. Silicone is not a thermoplastic, so you’re not going to get it to behave well going through a hot end, or a laser sintering process. It MAY be possible to create a photopolymer version of silicone, but I’ve never heard of it. There are UV cure silicones, but that’s not quite the same. BUT, here’s the thing: filament deposition printing is just one type of deposition printing. You COULD print silicone in the same way that concrete and cookie dough can be printed – you just use a nozzle with a motorized syringe or other sort of positive-displacement pump to deposit a layer, then cure it, then deposit the next layer, and so on. This may be a slow process. The advantage of the extra step (making a silicone mold from a 3D printed PLA part) is that you can do post-processing on the part, such as filling and sanding, before making the mold. You can’t really do this on silicone that’s been printed directly. “…unobtainium if you can get it.” You can’t. I like how you said that casting metals in a 3D printed mold are a great way for a custom and durable metal piece at home. My dad is looking into getting metal cast for a specific project he is working on. I appreciate the article on how to cast in a 3D mold.